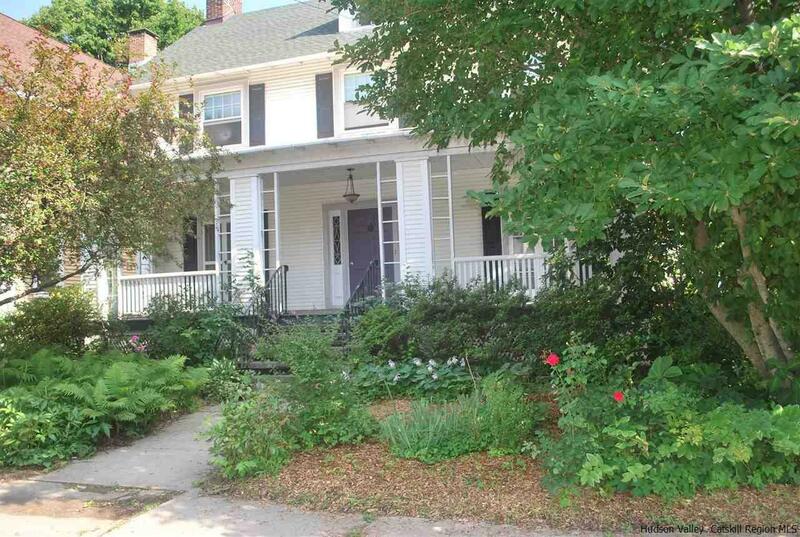 This beautiful colonial in historic uptown Kingston has it all! Enter this classic home via a lushly landscaped front garden and up the vintage stone steps. A gracious rocking chair front porch that graces the entire width of the house is perfect for enjoying morning coffee or the evening breeze with the privacy of mature plantings surrounding it. A classic entryway and ample foyer bring you through to an elegant, large living room with stunning period brick hearth. A classic paneled den behind the living room overlooks the spacious backyard, making it a perfect place for a home office or library. The first floor also features a beautiful, bright dining room with cozy window seat that can easily seat 12 for dinner or any occasion. Both living and dining room have original French doors that open on to the front porch making for an open, airy flow reminiscent of earlier times. An ample kitchen with large windows overlooking the backyard welcomes morning sun for a perfect breakfast space. Contemporary glass cabinetry, new appliances and a spacious, walk -in pantry and half bath compliment the classic layout. The unique stairs with vintage details and bright sun-filled landing bring you to four spacious bedrooms. Each bedroom has generous closet space. There are two full baths including one in the master bedroom. A secret walk-out private balcony nestled between the two back bedrooms has views of the backyard and tree-filled surrounding neighborhood. The walk-up third floor is the perfect space for easy access to storage. The deep lot with ample fenced backyard has plenty of room for gardens, patios or deck and pool. The oversized, detached, two-car garage has extra storage and brand new doors. Recent updates include central air, kitchen cabinets and new appliances. The recent roof and vinyl siding make upkeep easy. Original hardwood floors, up-to-date windows and period details throughout. Huge basement also provides ample storage or expansion opportunities. Walk to everything in desirable uptown Kingston including shops, restaurants, farmers market and NYC bus, This wonderful home is waiting for its next owner! 146 Main Street awaits!